On screen art creation and off screen art creation are different. I have found that many great apps offer great art activities. They use features that are available with the new technology, provide unique perspectives that are otherwise impossible to share. But we should not limit the art on the screen. Whenever possible I like to bring the on screen art off screen. 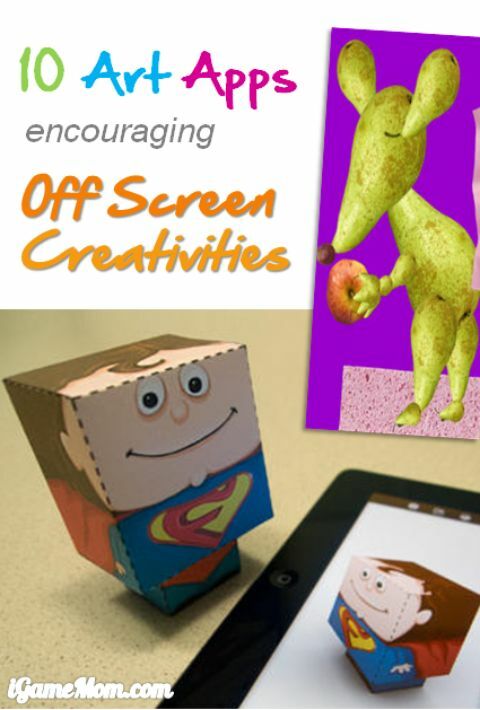 Here are 10 art apps for kids that easily be used off screen for creative activities. Click on each app title, you will find more details and easy download links. Drawnimal : a fun drawing app. What makes it unique is that kids see partial drawing on the screen, then locate the screen in the middle of a big piece of paper to finish the whole picture on paper. Parents can easily copy the picture on the screen to paper as “clue”, and ask kids finish the whole picture. Sandwich Chef : kids make sandwich art with suggested simple and healthy food items that can be easily find in your refrigerator. After making the arts on the screen, make sure having kids make some real Sandwich for themselves. Kids learn to be creative and to choose healthy food too. My Flake : kids make snow flakes and learn symmetry at the same time. After doing it for a while, it will be fun to do it on real paper. Drawing for Kids : an app showing step-by-step guide on drawing objects kids love, like different animals, cars, rockets, flowers. There are over 30 objects covered in the app, and you definitely want to do it on paper after trying it on the screen. Faces iMake : kids make arts using ordinary household objects, such as apple, spoon, cups, … Parents can help kids use the arts in the app as inspirations, and create some arts using real household items they can found in the house. LEGO Movie Maker : a free app from LEGO letting kids to create motion pictures with ease. Kids don’t have to limited the items to LEGO, they can use any thing for their movie making. Easy Studio : an animation app that letting kids create animations using different shapes. Parents can help kids cut out some shapes with papers, color the paper shapes, make picture and stories off line. Foldify Zoo : kids can design their own animal based on the provided template, print out the template and fold … and they will have their own animal. They will also learn about the animals too. 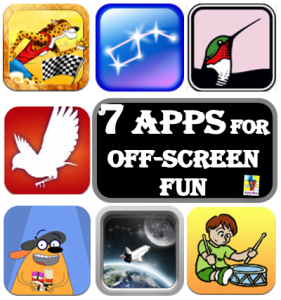 For more apps that encourage off-screen activities, please visit 7 Apps for Off Screen Fun.